HONOLULU -- Health officials say a baby born in a Hawaii hospital is the first in the U.S. with a birth defect linked to the Zika virus, a tropical illness currently found in Latin American and Caribbean countries. The Hawaii state Department of Health said the baby's mother likely contracted the disease while living in Brazil last year and passed it on while her child was in the womb. Here are some questions and answers about the case. IS THERE A RISK THE VIRUS WILL SPREAD IN HAWAII? The Zika virus is spread when a mosquito bites an infected person and then bites someone else. It is not transmitted from person to person. Dr. Sarah Park, the Hawaii state epidemiologist, said Tuesday the mother no longer had the virus when she arrived in Hawaii and the baby no longer had it at the time of birth. There was no chance a mosquito could have bitten them and spread it to others. 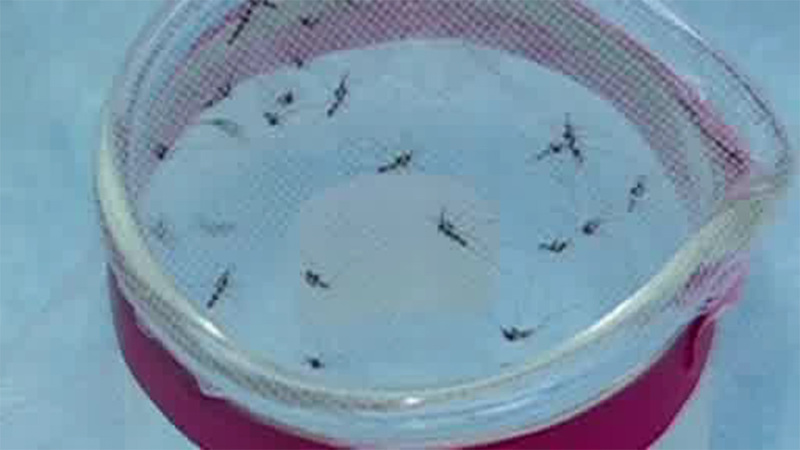 One of the mosquitoes that can carry the virus, Aedes aegypti, is not common in Hawaii. It has been found in some pockets of the islands and is blamed for an ongoing outbreak on the Big Island of the dengue virus, which is spread the same way as Zika. Dengue can cause high fever, headache, nausea and other symptoms. HAVE PEOPLE IN THE UNITED STATES CONTRACTED THE VIRUS BEFORE? The Centers for Disease Control and Prevention said at least 26 travelers returning to the U.S. have been diagnosed with Zika since 2007 - all of them believed to have caught it overseas. In addition, a person in Puerto Rico who had not traveled was diagnosed with the illness. On Tuesday, Illinois said two pregnant women tested positive for the virus after traveling to countries where Zika is found. Physicians are monitoring their health and pregnancies. Since 2014, the state of Hawaii has documented six people as having caught the virus in other countries, but there is no sign the disease spread to other people in the islands. HOW DOES THE VIRUS AFFECT PEOPLE? Zika causes only a mild illness in most people. Those infected can show fever, rash and joint pain that may last several days to a week. In Brazil, which is combatting a large outbreak, there has been a significant increase in cases of a birth defect linked to Zika. The birth defect is called microcephaly and involves babies being born with smaller than expected heads that may not have developed properly. Dr. Cynthia Moore of the CDC told reporters during a conference call last week that it's hard to predict at birth how the condition will affect a child. But in severe cases, babies with microcephaly may have seizures, vision problems and developmental disabilities. WHAT ARE MEDICAL EXPERTS ADVISING PEOPLE TO DO? The CDC has issued an alert asking women at any stage of pregnancy to postpone travel to 14 destinations in Latin America and the Caribbean. The agency also has advised U.S. travelers to take steps to protect themselves against mosquito bites if they visit places in Latin America or the Caribbean where Zika has been spreading. The advice includes wearing long sleeves and long pants and using insect repellent. Park said the Hawaii case is a reminder that there's potential for diseases to be introduced to new areas. "It's a global village, people travel easily from various areas. You can't just say that we're so far away from where the disease is normally recognized that there's no possibility of ever seeing it where we live," Park said. She urged people in Hawaii to get rid of potential mosquito breeding sites around their property.